Whether you go on frequent family camping trips or you're off to a festival this summer and can’t bear the thought of sleeping on the floor, a camping air bed is the best way to achieve a good sleep that is as close to the one you’d get in your own bed. Of course, a camping bed is seen as more of a luxury, so make sure you’ve got the essentials covered first. The main thing to consider when purchasing a camping bed is what is most important to you. Air beds tend to be very popular because they’re lightweight and compact, but you do have to be prepared to put in some elbow grease when pumping them up, and consider that it might deflate slightly during the night. If you’re off to a festival or on a short weekend away, camping air beds are the most affordable option. Camp beds are a little more supportive. They usually have legs and a proper mattress which is less likely to squeak every time you move an inch, therefore providing a more comfortable sleep on those longer camping trips. However, they will, of course, be heavier to carry so it is down to you to decide whether it’s worth lugging it to the campsite or not. If you invest in a camping bed like this, they can also be used as spare beds in the home when guests come to stay, so they’re definitely worth the extra money if you think you’ll have this use for them. 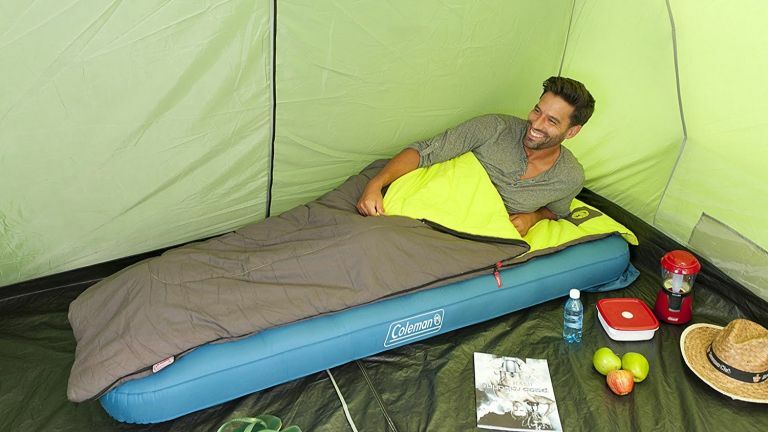 If you want ultimate comfort in the quickest time then this inflatable camping bed is for you. It features a built-in electric pump that will have this bed ready to go in a matter of minutes, and the 28 different air coils are designed to provide a stable and even surface to sleep on that you don’t always get with other air beds. It sleeps two, and is said to only make a little noise when moving around, so you can expect to get a good night’s sleep on this one. It would work just as well as a guest bed as it would a camping bed, so you’ll definitely get your money's worth from this one. For those who just don’t like sleeping on the ground, this pop up camping bad is quick and easy to use. It’s so lightweight, even more so than an air bed, making it easy to carry and set up on site. It is lined with ThermaCapture foam which helps keep you warm at night and the multiple feet keep the bed sturdy so you can expect a sound night’s sleep without risking waking up on the floor. It comes in a handy carry-pack to make your camping trip a hassle-free experience. This is the best camping bed for a home-away-from-home feel. It is of standard height which means it’s just like a regular bed, and you’ll be able to sit on it with your feet on the ground, plus the 32 air-springs are designed to create a soft but firm surface that reduces the bowing in the middle when two people are sleeping on it. Despite its size, it is said to be quick to inflate, and more importantly, easy to roll up and pack away. For anyone who’s not a fan of the great outdoors, this camping bed should make you feel more at home. For those who don’t like sharing a bed with people at the best of times, doing so on a camping trip probably isn’t going to be all that fun. This single camping bed is the ideal size for one person to sleep comfortably in their tent, and can easily be inflated in minutes. Due to its size, it is incredibly lightweight, but you can expect the tough coil system to provide a soft yet stable surface for you to sleep on. For the quickest set up possible, this Outwell foldaway camping bed could be the one for you. With no assembly required, this bed simply folds out and away you go. It’s not the lightest on the list, but by no means heavy, either, so it depends what you feel is more effort- carrying it or setting it up. It has a built-in padded head cushion for extra comfort so you can literally nap at a moment’s notice if you wanted to. This inflatable kids’ bed might be a welcome break when on a family holiday. Rather than have to spend time setting up lots of beds, this one simply inflates within minutes and has an integrated cover so that it is ready to sleep in. It’s lightweight and also has a machine washable cover so that it is easy to clean after a weekend away with the kids or a sleepover with friends.